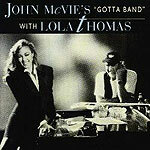 CD review: "John McVie's Gotta Band with Lola Thomas"
This review first appeared in the July 17, 1992 issue of the North County Blade-Citizen (now North County Times). Fleetwood Mac bassist John McVie  who's been with the band since its inception in the early '60s when it was a legitimate blues band fronted by Peter Green  has come back to his blues/jazz roots on this album, backing young protege Lola Thomas on her debut. To introduce Thomas, McVie has assembled a strong cast  former Rolling Stone Mick Taylor and current Mac member Billy Burnette on guitars; McVie, of course, on bass; and the Memphis Horns (Wayne Jackson and Andrew Love). The effort was produced, and many of the songs co-written, by Dennis Walker from HighTone Records, the man who helped propel Robert Cray and Joe Louis Walker, among others, to both popular and critical acclaim. Thomas has limited vocal range, but she knows how to get the most out of what she does have, much like contemporary torch singer Sade. Also like Sade, she exudes sexuality through her vocals, seducing the listener with her low, husky voice. Her timing is right on the mark, her sense of presence and poise strong enough to allow her to front a band of experienced musicians without sounding intimidated or hesitant. Despite her relative strengths as a vocalist, it may be as songwriter that Thomas shines brightest. The music here is a collection of jazz and R&B originals, with six of the 10 written or co-written by Thomas. This is a strong outing of R&B, blues and jazz, and we are likely to be hearing more from Lola Thomas.